Kathy Nicholls is the grandchild of the late Sir Doug Nicholls, noted footballer as well as the first Aboriginal person to be knighted and the first to be appointed to vice-regal office (he served as Governor of South Australia in the 1970s). The suburb of Nicholls in Canberra is also named after him. Kathy was born in Swan Hill in Victoria, where her parents took the family into the bush on a regular basis for walks and camps along the Murray River, handing down the knowledge about the environment - land, water, sky, animals and to identify the plant life, trees and shrubs. Kathy identifies herself from father's line Wadi Wadi and Yorta Yorta (Victoria) as well as her mother's line, Ngarrindjeri (South Australia). 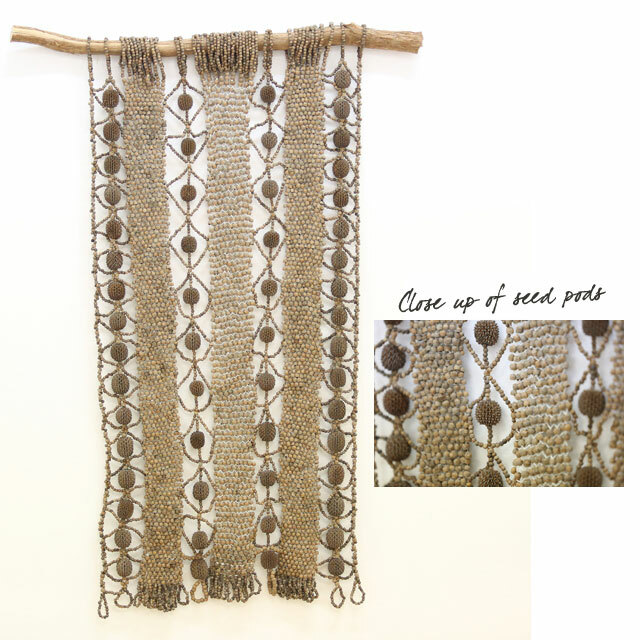 My inspiration to create this piece was the connection to my mother as my Elder and Teacher using seed pods. I have used the Shea-oak seed pods as a connection to my mother’s country in Ngarrindjeri lands in South Australia and myself using bottlebrush seed pods from Victoria. I wanted to show our connection that “everything has its beauty but not everyone sees it”. The life cycle of the pods begins from earth – the pods flower and get rid of their seeds and then the pods are left to mother nature. This shows our journey as two women in our life cycle. As a young girl my mother and my grandmother showed me how to weave and sew. The art piece is part weaving, knotting and sewing. There are three main woven panels of bottle brush seed pods. Each bottle brush seed pod has been drilled and individually knotted. Individually knotted means we are ourselves as individual women. These panels represent us as women united together with strength. The shea-oak seed pods represent the older women as mentors in each of our journeys teaching the younger women. The outer woven smaller bottle brush seed pods represented the younger women growing up. Together it represents Aboriginal women united and learning from each other – younger, middle age, and older women as our mentors. The lemon scented tea tree branch hold us together. The circles of bottle brush pods at the bottom represent all us women coming together as groups. This work won the Lend Lease Reconciliation Award in 2013.